Is it possible to live a word for a year? Not a phrase or a verse or a quotation – but a word. This is the challenge I put forth to you today. For many, the year end is a summary, an accounting, a tabulation of achievements and trials alike. As the New Year approaches many of us breathe a sigh of relief for the calendar-designed opportunity to consider new beginnings. Some make resolutions. Some have reservations. Some consider nothing. But the select few – the creatively self-motivated like you and me – select a single word to live by in the year ahead. It’s an intriguing exercise – one that takes some time to ponder. What will my word be for 2016? I’m considering initiative and happiness at the moment. I wonder if these are too mundane. And then I ask myself, “Who cares?’ The thing is…I need a word I can live EVERY DAY and feel very, very good about it. It will carry me through any troubling, confusing, or reflective time. It will be my personal unspoken philosophy to guide my path. It would be easy here to begin listing many words for you and me to consider. But I won’t do that because you will find your word your own way. When you do, I hope you will be pleased with yourself and enjoy a meaningful NEW YEAR – guided by the light of your single word. 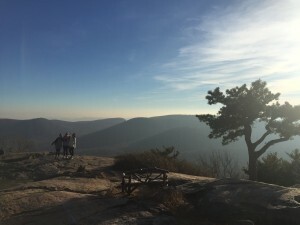 …to my Millennial daughter and her NYC friends who on a Sunday car trip returning to Brooklyn from hiking Bear Mountain (see photo) solidified together the excellence of this idea. I bestow a special thanks to Brooke who authored the idea, having lived the word authenticity in 2015. And then shared her idea on the long car trip home to Brooklyn. Evidently, the word worked.